Today was my first “real” day back on the motorcycle after the April 6th accident. ‘Twas nice! I went up Ouray, Colorado, County Roads 5, 7, and 9. Sadly, the GoPro camera didn’t work, which I later traced to a bad memory card. (Rats! I had spare memory card with me at the time!). But I did get a few pictures of the wildflowers along CR 5. 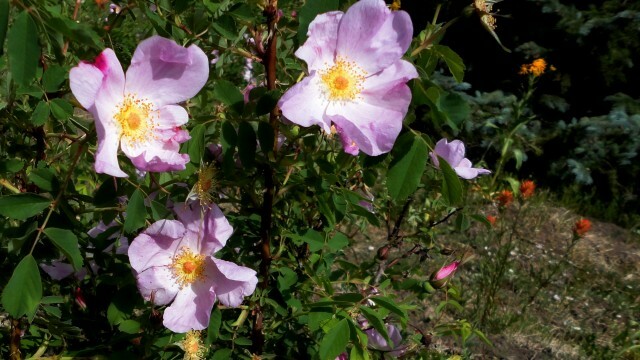 The wild roses above appeared at the trailhead for Moonshine Park. The colorful collection below were further north on CR 5. The day was a bit gray, but that’s all the better for taking flower pictures. 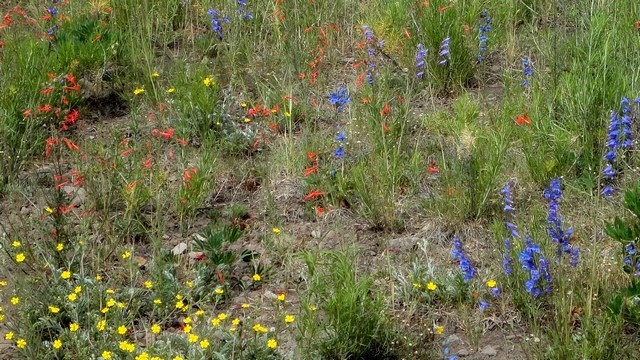 Wildflowers along Ouray, Colorado, County Road 5, including fairy trumpet (the orange ones) and blue bells. The trailhead for Blue Lakes Trail is at the end of CR 7—it looked like a shopping center parking lot! I guess everyone had the same idea at the same time—a nice Fourth of July hike into the high country. This entry was posted in Motorcycling, Ouray County, Wildflowers and tagged blue bells, fairy trumpet. Bookmark the permalink.